I have planned another nS0TA adventure extravaganza for August, this time to Coloradio for two adventures: 1) the annual Colo-14er N0B event ( see http://n0b-14er.blogspot.com/ for detail information) and 2) three days in Rocky Mtn Nat'l Park. I've never spent any time in ROMO (see http://www.nps.gov/romo/index.htm for info) and am looking forward to exploring this magnificent NP. A local ham (W0LI) who also is a volunteer at the Park has assisted me in logistics planning: Aug 2/Tue: SOTA activate Hallett Peak (W0/FR-018), an iconic ROMO landmark. More info and pictures at http://www.summitpost.org/hallett-peak/151577. On Aug 3/Wed: activate Yipsilon Peak (W0/FR-009), another beautiful peak in the Mummy Range NW of Estes Park. 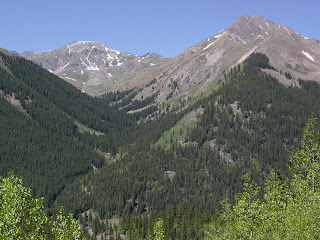 See http://www.summitpost.org/ypsilon-mountain/151685 for some great pictures. Then on Aug 4/Thurs: W0LI/Rich has organized a "sunrise" local club hike and "demo" activation of Sundance Peak (W0/FR-019). The 3 or 4 am departure may be the biggest challenge! More info and pictures at http://www.summitpost.org/sundance-mountain/152726. Then a drive south to Steve's/wG0AT place near Colo Springs to prep for our three day adventure into the San Juan Range in south central Colo for our "big 14-er event" for N0B and participation in the annual Colo-14er ham radio special event on Aug 7th. This year KT5X/Fred will join us. The plan is to drive into the trailhead on Friday, camp and hike locally, then on Saturday move up to a higher base camp (around 12,000 ft) in preparation for an early, before dawn departure on Sunday. Our faithful sherpas, Rooster and Peanut will help us "ol' goats" with the logistics! You can see some great pictures of Handies at http://www.summitpost.org/handies-peak/150302. In all cases, we plan to operate at least one station on 14.061-CW. Watch qrpspots.com for more information each day for these trips. Follow us at http://aprs.fi/?call=Wg0at-7. We look forward to working you! Monday/18 Jul: 7 hr driveup from NJ to the Whites. Camp at Layfayette Campground. Tuesday/19 Jul: Hike the Franconia Ridge Loop with a stop at Mt. Layfayette (W1/HA-002). See http://www.summitpost.org/mount-lafayette/150537 for some nice pictures and detailed info. Wed/20 Jul: Hike the Hancock Loop Trail with a stop at Mt. Hancock (W1/HA-046). See http://www.summitpost.org/hancock-north-peak-and-south-peak/153470 for some nice pictures of the "Hancocks". Thurs/21 Jul: If the wx cooperates, this will be a "double" attempt as Mt Jefferson (W1/HA-120) and Mt Adams (W1/HA--093) are within 2.5 miles of each other. See http://www.summitpost.org/where-s-the-snow-a-late-november-romp-in-the-presis/254436 for some info. Also http://www.summitpost.org/adams-and-madison-adventure/232724. Fri/22 Jul: This will be a quick one if the wx is cooperating to Wildcat Mtn (W1/HA060). Sat/23 Jul: This is the BIG one, a benefit climb for the wx observatory at the summit. See http://www.summitpost.org/mount-washington/150248. Much has been written about Mt Washington. I look forward to the visit and, wx and wind cooperating, the SOTA activation. The "Seek the Peak" organizers are planning somewhat of a big festival/party with some 500 folks planned to attend. Just more really good stories! Hope to work you during this nS0TA week! Regards, Guy/N7UN with the club call nS0TA. I will activate 4 peaks in VT from July 4th-6th on a 3 day camping/hiking trip. The wx looks favorable right now. July 4th: Mt Stratton (W1/GM-007) at 3,940ft (1201m). This will be a 9.3 mi loop hike. Planned summit time of 1800 utc with my K1 on 14.061-cw. Overnight camp at Grout Pond. July 5th: Pico Peak (W1/GM-183) at 3,957 ft (1206m) will be first. With a 2.9 mi hike to the summit and a planned activation at 1500 utc with my K1 on 14.061-cw. Then around 1700 utc or so, I'll hike 3 mi south along the Appalachian Trail to Killington (W1/GM-002). Killington is the site of a famous NE ski resort. Elevation is 4,235 ft (1291m). Planned activation time is around 1900 utc. I will then hike the return route for a total hike of about 12 mi. July 6th: I'll drive north to Mount Mansfield, VT's tallest mtn at 4,393 ft (1,339m). This will be a 7.9 mi loop hike. Planned summit time of 1600 utc. I've never hiked in the Green Mtns before so changes in the plans can occur. I will announce via Twitter to qrpspots.com my status and any changes in these plans.